Played many times before. For a while my family had a foosball table in our living room. Though it might have been slightly smaller than the standard size foosball table. My friend CF has a foosball table which I recall playing on a couple times. And once in my second year here in grad school we played various rounds two-on-two (LS, MJ, AK, and I). I came back from CA and I call up Arash. Our intention was to play some pool, but their was no supply manager working. So we were content with playing a round of foosball. 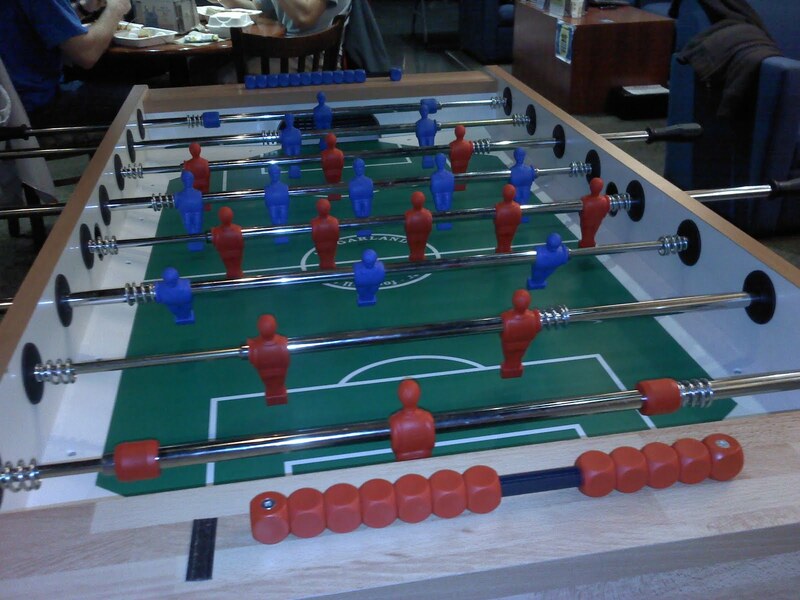 It's not as easy to hold a conversation over foosball, but we do a bit of talking. In any case, it was a close game. Given the desire to play pool, I proposed the idea of getting our own set of billiard balls. He seemed open to the idea, but it's questionable whether or not he'd actually agree to buy even just a cue stick. We'll see.